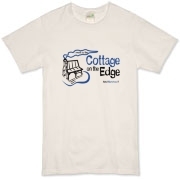 Cottage on the Edge - the DIY Cottage Blog: Congratulations to our T-shirt Contest Winners! Congratulations to our T-shirt Contest Winners! How do you get an "on-the-EDGE" T-shirt? 3) Buy one at the on-the-EDGE Store. Yes! the contest is still on as we have extended it to the end of the year. One ballot will be entered into the contest for your initial registration and for each comment you give to a Post - the more comments you make the more ballots you have. There is a winner drawn each month!